[Dave] has some big plans to build himself a 1980’s style computer. Most of the time, large-scale projects can be made easier by breaking them down into their smaller components. [Dave] decided to start his project by designing and constructing a custom controller for his future computer. He calls it the Rabbit H1. [Dave] was inspired by the HOTAS throttle control system, which is commonly used in aviation. The basic idea behind HOTAS is that the pilot has a bunch of controls built right into the throttle stick. This way, the pilot doesn’t ever have to remove his hand from the throttle. [Dave] took this basic concept and ran with it. 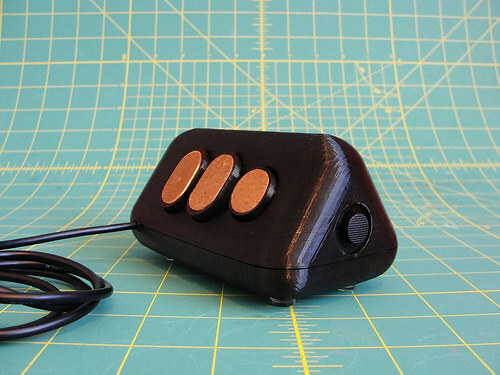 He first designed a simple controller shape in OpenSCAD and printed it out on his 3D printer. He tested it out in his hand and realized that it didn’t feel quite right. The second try was more narrow at the top, resulting in a triangular shape. [Dave] then found the most comfortable position for his fingers and marked the piece with a marker. Finally, he measured out all of the markings and transferred them into OpenSCAD to perfect his design. [Dave] had some fun with OpenSCAD, designing various hinges and plywood inlays for all of the buttons. Lucky for [Dave], both the 3D printer software as well as the CNC router software accept STL files. This meant that he was able to design both parts together in one program and use the output for both machines. With the physical controller out of the way, it was time to work on the electronics. [Dave] bought a couple of joysticks from Adafruit, as well as a couple of push buttons. One of the joysticks controls the mouse cursor. The other joystick controls scrolling vertically and horizontally, and includes a push button for left-click. The two buttons are used for middle and right-click. All of these inputs are read by a Teensy Arduino. The Teensy is compact and easily capable of emulating a USB mouse, which makes it perfect for this job. [Dave] has published his designs on Thingiverse if you would like to try to build one of these yourself. “[Dave] was inspired by the HOTAS throttle control system, which is commonly used in aviation. The basic idea behind HOTAS is that the pilot has a bunch of controls built right into the throttle stick. This way, the pilot doesn’t ever have to remove his hand from the throttle. [Dave] took this basic concept and ran with it.” -> a normal mouse? Ok, so I read the actual build log. It seems that “locomotion” is controlled with his thumb using an analogue stick. The three buttons have regular “mouse” functions. One of the buttons (presumably the index-finger one) is apparently also a stick (not clear if analog or clicky) with center click, so while clicking it acts as a normal button, wibbling it up/down or left/right scrolls in lieu of one of those two-axis tilting mouse wheels. It would be great for wearable, though that’s not what I think of when I hear “1980’s style computer”; it would also be real nice if you could replace the ball in a spaceball or similar 6DOF controller with this, thus combining mouse and 6DOF in one hand. Anyway, I’m always happy to see people trying odd-ball controllers, even when I’m not clear on their advantages. You can see by looking at it that the thumb control is a joystick like in a PSP or such. Either a sliding or a slightly rotating one. It’s analog, but probably still more of a joystick than a mouse type pointer. I like the idea but as someone with arthritis and carpal tunnel I can tell my thumb would freeze up after a while with this input device. That said, I really do like the concept just don’t know how long I’d be able to use it. Well I think since the thumb controls the cursor if you made this a regular mouse, moving the entire thing controls the cursor, would make it easier for the arthritic I think. Heatgap, You may have already tried this but it may help someone else. I have found that setting the pointer speed about 2 clicks below max and tick the “enhance pointer precision” helps me greatly with the required wrist motion troubles. I usually set the center wheel for around 7~8 lines per click. These settings usually give a pretty good (low pain) response across dual monitors, yet smooth enough to not be hard to “point and click” in the needed spots. My favorite was an older, large track ball that I had re-written the string of values in the acceleration/response curve of the driver. The ball eventually died** and I’ve lost track of the floppy with all of my laborious re-typings of the response curves.